Nice pattern, just in time for gift giving! Thank you Nema517 and TallGirl! TallGirl you really need to look up these patterns! Headband pattern "The Genius Headband"
Thanks alacajun! I just made one for myself out of cashmere yarn that was in my stash and it is warm! Thank you! I like both of these patterns. Thanks for the link magiccrochetfan! I won the yarn and Fashions to Flaunt book from the Crochet Dude! Any ideas for a one skein project? TIA! Yes I do love cables, magiccrochetfan! I made these two great free patterns for my son. The hat is by Lisa Naskrent and I hadn't made this in a long time. It is a great hat. 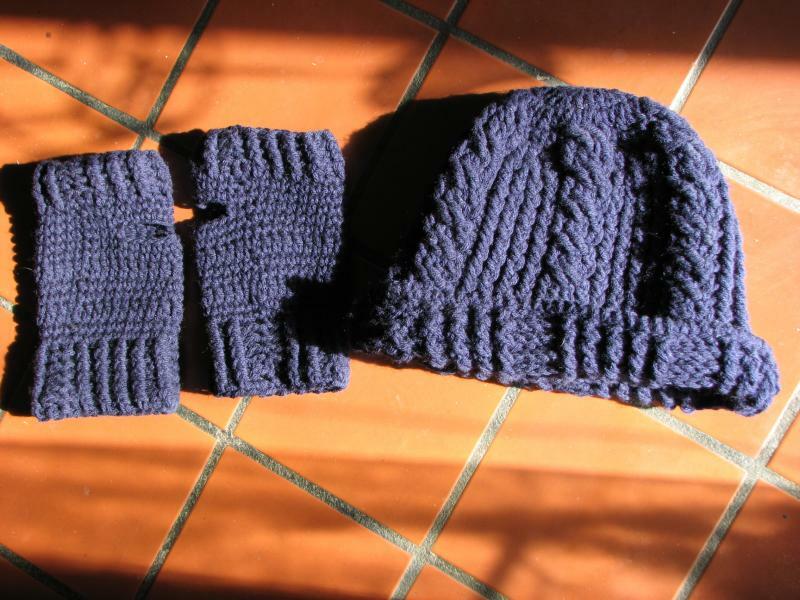 The mitts are by Suzetta Williams and seem to go with the hat perfectly! Such a good idea! I think mods can be made for Kindle. Thank you Empress Busy Bee and TallGirl!